Crossfit Kiawah is one of those clients that we don't do much work with long term. They just needed a landing page set up to collect information on people that are interested in doing Crossfit while on vacation at Kiawah Island. We have no problem designing and developing small projects like this. 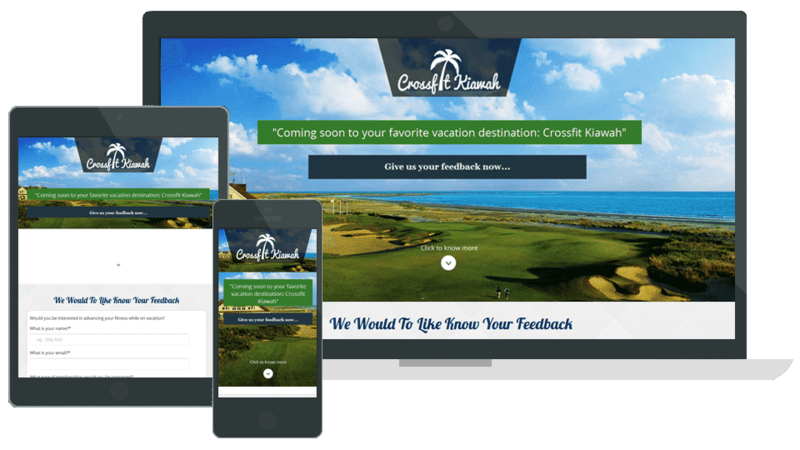 We created a simple WordPress landing page that has a contact form and an automated blog feed pulling in articles about Kiawah Island. Check out the site. It looks great, is simple, and just gets the job done. Crossfit Kiawah implements a great business tactic that we suggest to a lot of our clients. It allows people to test the market and see if a business is viable. If Crossfit Kiawah wanted to open up a gym, it would be expensive. Kiawah Island is the most expensive real estate locations in South Carolina. So, instead of spending a ton of money to start this business without much information. These clients used this landing page to test the waters, see if there is a lot of interests. Tim Ferriss of the 4 hour work week uses and teaches this method. At Grover Web Design, we bring more than just web design and development to the table. We have experience with business consulting as well as starting businesses. As with all our sites, we set up Google Analytics on Crossfit Kiawah. As their web consultants, we educated the client on how to use the analytics software and what were the important aspects to monitor. First off, obviously the most important metric is users. The main aspect of the analytics that they monitor is the number of people who visit the site compared to the number of people who fill out the form. This is a direct indicator as to how interested people are in working on while on vacation at Kiawah Island. Next, we instructed our client to monitor the geolocation of their visitors. It was interesting to see that most visitors were from New England. This helped them to realize how they were servicing Northerners not Southerners. This is a big distinction in a business and really helped them to know their customer. Web design and development, was just a small part of this project. We actually had the website part done within 3 days, but out job doesn't stop there. We were helpful consultants to this client to bring them to their objective and really teach them who their target market is for their business. Contact us to talk about how we user or website building and business experience to help you achieve your objectives.